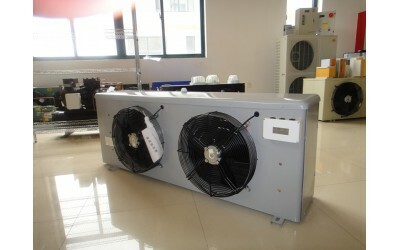 The D series of coolers, has DL、DD、DJ three sub series of products for different temperature rangers.DL for around 0℃，DD for ~-18℃, DJ for temperature below -25℃ rooms. ◆ outside using high quality stainless steel panel, external appearance, with wear-resistant properties of high strength, surface by special casting process. ◆ internal evaporation tubes arranged in a crisscross pattern of the way, use its special structure, which combines aluminum and brass perfect, has excellent heat exchange. ◆ rows of high power heating pipe inside the tube evenly distributed in cooler places, ensure the defrosting effect of condenser. ◆ cooler internal water disk structure is good, the professional form of preventing it from creating icing phenomenon. ◆ special requirements or other requirements can be customized according to customer requirements.